Here, unexpectedly awesome gnocchi recipes that go way beyond the typical potato or ricotta. In this week’s edition of Mad Genius Tips, F&W’s Justin Chapple revealed the coolest, easiest way to cut perfectly shaped gnocchi—no knife required. Once you’ve mastered the technique, try it on one of these unexpectedly awesome gnocchi recipes that go way beyond the typical potato or ricotta. 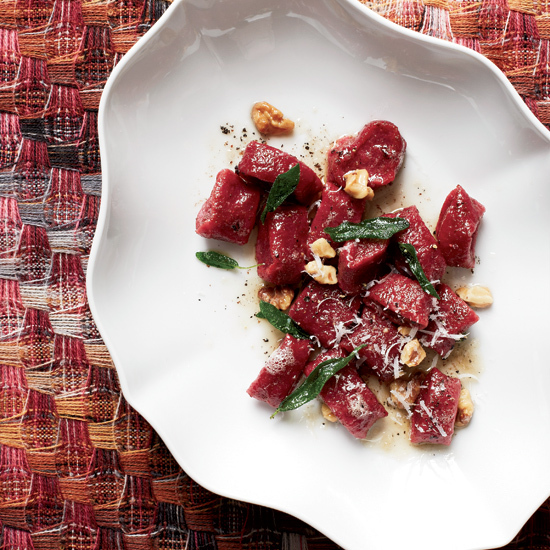 F&W Best New Chef Jenn Louis found these intense beet gnocchi in northwestern Italy. They are sweet and earthy, and so delicious they barely need a sauce. These spinach gnocchi are more intensely flavorful than the traditional ricotta kind. Pureed carrots give these gnocchi a subtle sweetness and gorgeous tangerine color. These earthy lentil gnocchi are served in a rich foie gras soup. Vibrantly purple, this gnocchi is based on a Malay specialty called Abacus Seeds, which is made with a purple yam–and–sticky rice flour dough.